"One man's journey of a lifetime"
Lloyd Figgins is Earthwatch’s Head of Global Field Safety. With many years of expedition and risk management experience, the lure of adventure is never far away for Lloyd. 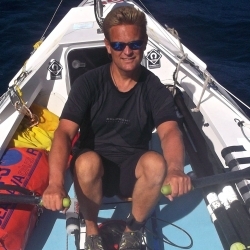 In December 2011, with his friend David Whiddon, he embarked on a two-man expedition to row across the Atlantic Ocean. During their mission, the pair raised funds for the RNLI, as well as collecting data about the marine life that they encountered for environmental charity Earthwatch. 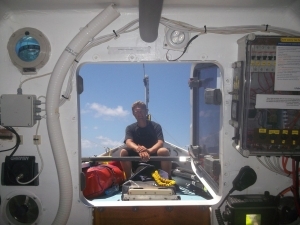 Here, Lloyd shares with us some of his experiences of his time on the ocean, and his reflections on the vulnerability of marine wildlife, and our responsibility to protect it. As far as doing something original in ocean rowing was concerned we discovered that the route from Morocco to the Caribbean was not only rarely trodden (or rowed) but that no pair had ever successfully rowed it non-stop. The last pair that had successfully crossed from Morocco did so in 1974, stopped twice in the Canaries en route and took 103 days to complete the challenge. The idea of either departing from or arriving on a continental landmass also appealed, so Morocco became our chosen departure point. I work for Earthwatch and as part of the row I had wanted to undertake some research that would benefit scientific understanding of the marine environment. We had a couple of advantages on this front: As we would now be travelling away from the main shipping lanes, we could record sightings of marine life that otherwise might not be captured. We were also travelling slower than most other vessels, so would have more time to identify and record sightings. Earthwatch’s research team put me through my paces on marine species identification and I was provided with field guides and spreadsheets to record sightings of whales, dolphins, jellyfish, turtles and sharks. Duly trained and equipped, I became a citizen scientist! Our first visitor was a Kemp’s Ridley turtle. It’s worth noting that six of the seven species of marine turtle are classified as threatened with extinction and three species are considered critically endangered, the Hawksbill, Leatherback and our little Kemp’s Ridley. We were therefore delighted that in this particular area just off the Moroccan coast we saw lots of turtles including one huge adult leatherback. Leatherbacks are great for another reason: they eat jellyfish. Whilst jellyfish are an important component of oceanic food webs, their populations have exploded in recent years. Many scientists attribute this to overfishing, nutrient pollution, global warming and the introduction of non-native species. Off the French coast aggregations of jellyfish have sunk 500 pound fishing nets and in Israel and Japan they have blocked the water intakes of power plants! However, the only species of jellyfish we encountered was the Portuguese man o’war. It was a striking creature, but they pack a nasty sting. We always made sure we had a good look for them before going overboard for a swim, to have a wash or to clean the hull. The other thing we kept a close eye out for were fins. Seeing these would definitely cause us to postpone any overboard activities! About 500 miles off the Moroccan coast we were visited by a 2.5-metre short-fin Mako shark, who followed the boat for a while before deciding against having an ocean rower for dinner. It was only when I got back to Oxford that I discovered that between 1980 and 2010 there had been 42 recorded attacks by Makos on humans, three of which were fatal…. A few weeks later we spotted another shark following the boat and this we were able to positively identify as a Thresher shark by its long tail. Both Thresher and Mako sharks are considered vulnerable, so being able to record these sightings and send the data to Earthwatch was satisfying. About a week into the row we were visited by our first pod of dolphins. They are the most remarkable creatures and they seemed as curious about us as we were about them. I was resting in the cabin when I heard them clicking and whistling beneath me. From every direction they appeared - Atlantic Spotted Dolphins! 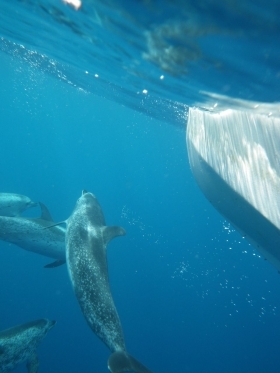 They were swimming at the speed of the boat and looking up at us from just a few feet below the surface. These were wild animals and as there may have been calves in the pod, entering the water was not an option. However, I did venture to put my hand in the water. One female looked at it curiously for a while before swimming right up to it and then darting away. She would then return to her safe distance before swimming up to my hand again. Every time we had a visit from dolphins it left us on a high and feeling great about life. I always slept better after interacting with dolphins. I made a commitment then that I would do all I could to protect them and their environment. It was a privilege to have such close interactions with so many species and it’s encouraging to know that the data we collected with be distributed by Earthwatch and benefit the scientific community. Day to day life on board involved a combination of rowing, eating, rowing, sleeping, rowing, doing chores such as washing clothes and ensuring the boat was properly maintain and more rowing. I actually loved being on the oars and the ocean is constantly changing. Sometimes the sea was very calm and at others we were dealing with seven or eight-metre swells and storms.Our skin suffered and it was impossible to keep dry. I was often soaked by huge waves, which would knock me off my seat, but you just have to climb back on and continue rowing. Yes it was hard, but this is where the “training ugly” really kicked in and actually I started to enjoy the adversity. I have no doubt that being both physically and mentally prepared for this challenge was the key to me enjoying it so much. I saw the positive in everything, even when it seemed everything was stacked against us. Other major highlights for me were the sunrises and sunsets as well as the solitude. It was a sad moment when, on the final day at sea, I watched the sunrise for the last time and knowing that I wouldn’t be passing this way again for a while. A large part of me didn’t want it to end, but I knew my time with the ocean was coming to a close and that she had allowed me to cross safely and was now delivering me back to land where I belong. We completed our journey after 60 days 17 hours, making us the first pair to cross non-stop from Morocco to Barbados. It was an experience that will stay with me forever.